Freudenberg Sealing Technologies is the largest division of the Freudenberg Group. The company and its 17,000 employees generate sales of approximately 2 billion Euros and produce seals and seal packages principally for the automotive industry, machine and ship building but also for the agricultural and construction site machinery sector. In pursuing its energy management plans the company has set itself a medium-term goal of recording the consumption data of electricity, gas and oil at all eleven sites in Germany. In the process the business areas decide independently on the introduction of the energy visualisation system, head office lending any support it can. Oberwihl with its raw material mixing works and vulcanisation processes is one of the most energy intensive areas. "In order to enjoy the benefits of energy tax refunds we were obliged to introduce an energy management system," explains Philipp Engel, the project manager responsible for energy management and industrial engineer at FST in Oberwihl. Current transformers and energy counters were attached to all important outlets of machines, plant and sub-distributors connected to the low voltage distribution network. They had previously been monitored by people running round and reading them off by hand. "This did not enable efficient energy monitoring," said Engel. "And this is why we looked for a system that could precisely record and evaluate the data." It should not just cover certain areas, but the entire works right down to machine level. Apart from reducing the energy consumed, the focus was above all placed on optimising peaks. Philipp Engel and his team were also keen that the system was as user-friendly as possible. "We didn't want to tackle energy management as merely a business project, which was why we confidently felt that only if all those involved liked working with the system would the project be successful over the long term," explains Engel. Four energy visualisation systems met the requirements. The Oberwihl site decided for "econ" from econ solutions. "The choice was easy because the system is so simple and meant that the other contenders were quickly out of the running," recalls Engel. The system is a modular one. It consists of a power sensor, econ sens+, the data logger econ unit as buffer memory for the measuring data and the virtual server econ serv, which stores and monitors the data in order to enable evaluation via the web-based software econ app. It provides different, freely-configurable process, consumption and cost logs. The maximum controller econ peak monitors the power management to reduce the peak loads. FST started off by consciously concentrating on power consumption as the biggest cost factor. Twelve data loggers were required for around 120 measuring points. In order to be able to undertake additional measurements at short notice and as and when necessary, FST also decided for "econ mobile". Pre-wired power sensors and a data logger are housed in a portable casing with outgoing sockets located in the casing side. The mobile unit can be employed easily at any desired point for a temporary measuring operation. The measuring data as well as that from the other recorders is transmitted to the server and the evaluation software via the network connection. Freudenberg Sealing Technologies installed the system itself. Set-up of the three new control cabinets was followed by installation of the data loggers and connecting and cabling of the roughly 90 consumers. "It was all done while our daily business was going on," says Engel. As the transmission of the data was to be effected via the internal network, the IT department in Weinheim had to issue and release additional IP addresses. This meant that the network connections could be established via the existing patch field to the data loggers. Numerous tests were necessary so as not to endanger data availability and company security. "However, there were no problems at all with "econ solutions". When needed they were on hand to provide technical support," stresses Engel. The system was up and running about six months after project launch. In order to ensure that it ran error-free, Engel and his team checked whether the data gathered from the econ units was plausible. 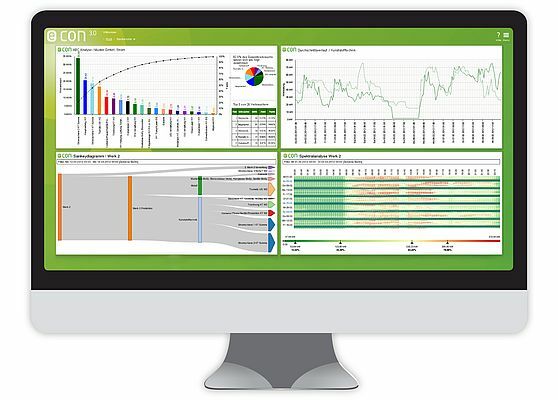 After a positive evaluation nothing stood in the way of a comprehensive energy management. Rolf Wagner, Head of Business Development at econ solutions, and responsible for the project says: "A few weeks after we had delivered the components I had still not heard anything back from the customer concerning set-up and commissioning. When I asked Freudenberg Sealing Technologies when they planned to do this, Mr. Engel explained that about 99% of the system was already running." Wagner held the induction training. "Nevertheless, most of it we picked up ourselves because everything was so simple and self-explanatory to use - precisely what we wanted in the first place!" reports Engel. "Even the Head of Industrial Engineering, Angelo Acerboni, had put together the evaluations the way he wanted to himself and immediately set off on his search. Support was provided by econ because it makes potential visually detectable." Since then the data recording has been running with great success. The first measure was to increase the flow temperature of a refrigeration unit by 2°C. The system controls the temperature of the coolant for plastic injection moulding machines and very frequently consumed a noticeable amount of energy. After it became clear that a somewhat higher flow temperature was possible, FST altered the control parameters correspondingly in a matter of minutes. The effect was visible immediately in the analyses: "The unit was hardly running." If the recorded results are applied over the entire year, annual power cost savings of 50,000 Euros are possible. The fact that the refrigeration unit is much less frequently in operation also means lower maintenance costs due to longer intervals and fewer repairs as well as a longer operating time of the machine. Another measure was to reduce the time for the preheating of tool plates, high power consumers in the vulcanisation process. The plates must have a temperature of 200°C for production. During downtime over the weekend they cool down, and they had hitherto been reheated about three hours before the start of work. The measurements revealed that they had already reached the required temperature after just 1.5 hours. This meant that the preheating time could begin correspondingly later and also reduced by half. "Measures such as these help to counter the increases - and continued increases - in energy costs and therefore to maintain our competitive edge," explains Engel. Meanwhile, existing intranet connections feed the energy data at the Freudenberg Sealing Technologies works in Oberwihl und Öhringen, where econ has likewise already been installed, together at head office in Weinheim. It, too, already possesses an econ system. It means that not just every works can view and analyse its own data, but that at head office Hans Kloos, Head of Investment and Energy Management, can also obtain an overview evaluation of all the branches. The introduction of econ in a further two to three sites is planned for 2015 and by the end of 2015 all 11 German FST sites are to be DIN ISO 50001 certified.